An Argument for ONE Angel Lisa! OK…so the piling on has started over my dislike for Angel Lisa. There are loads and loads of people telling me that “Lisa isn’t dead,” and that “Angels aren’t dead people, Saints are dead people” (which makes the whole Night of the Living Dead franchise take on a whole new meaning). WE ALREADY HAVE ONE IN OUR GAMES!!!!!! That’s right, “Ye of short memory and little faith in my powers of recall,” we already have Lisa with a 16-hour task, called “Be an Angel.” And she isn’t just being good…she is actually flying above the Nativity Scene that we got waaaaaay back in 2014, 2015 and 2016. And it came (comes) with TASKS for Homer, Marge, Lisa and Bart. 16-hour tasks that look like this! 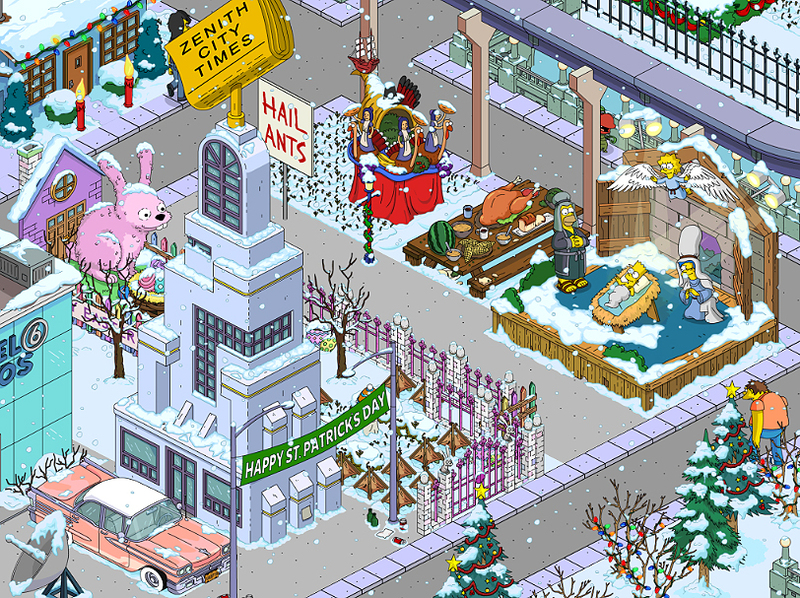 (this is a screen shot of my “Holiday Square” which is next to my Valentines Park). Hmmmm…. so you think you have me, do you? Well, as I was working on this, I went to check my Nativity Scene to see if Lisa (who is currently doing her task “Be an Angel”) has anything to say about it. And who should fly by? The IMPOSTER!!! At least that’s what I am pretty sure she said. Because, as I leaned closer, the new Angel Lisa whacked me in the ear with her tablet, and I lost hearing temporarily. So… yes…if you don’t already have it, you are going to get ANOTHER chance at the nativity scene in this Event (as a possible prize in the Winter Wonderland Mystery Box)…which most of us already have. And yes…when you get it, you will have a version of Lisa playing an Angel…which is not to be confused with the Angel Gabriel, which is what this new version should be called. Don’t believe me?? ZOOM IN on the tablet in the picture of both angels…and you can see the fine print says, IT IS WRITTEN IN THE WIKI THAT I SHALL BE CALLED GABRIEL! Don’t believe me still?? CLICK HERE!! So…let’s hear no more talk about whether we should or shouldn’t have another Lisa Angel in our games. Or whether she is dead or alive. I already have one Lisa…who can BE an Angel for 16 hours at a time…and that is all we need. And what is missing from this story? A skin for Burns as Herod, who would be doing his best (and likely getting confused) to count which Lisa is the real Angel Lisa! Because for me…the new one is Gabriel. Angel Lisa is dead to me. 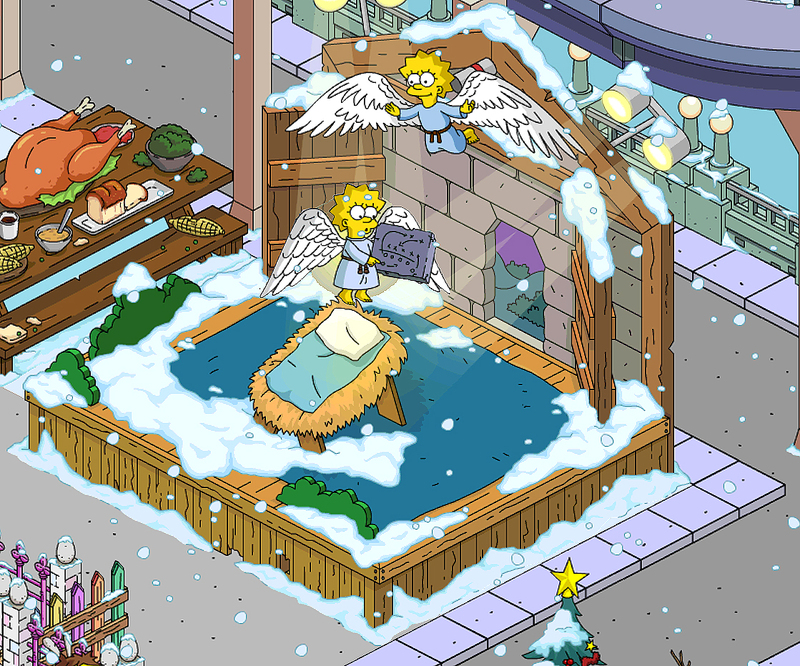 This entry was posted in Tapped Out and tagged Angel Gabriel, Angel Lisa., Tapped Out Tips and Tricks, The Simpsons, TSTO, TSTO Addicts, TSTO Community, TSTO CrankyOldGuy, TSTO Nativity Scene, TSTO Patric, TSTO Tips and Tricks. Bookmark the permalink. You slay me Patric! This post had me literally LOL’ing. I hate that my nativity is mostly dormant because the family is always busy doing other things, it used to just be in storage until I just brought my Praiseland back to town. Because they know that gambling is another addiction they can tap into. Why give it to you for 60 donuts, when they can trick you into spending 180 or more, trying to “win” it? I suppose the consolation is you may spend the same amount but you get other premiums too. For instance for Black Friday it took me a few tries to get the Calabresi’s but for 180 donuts, which I think was still lower than the original price, I also got Oscar Wilde, Chaucer and Johnny Tightlips. I have always wanted Johnny but not that ugly casino he’s attached to that I have to figure out how to hide as much as possible when I get around to incorporating it into my Springfield. For the most part I was really lucky that week, my number one must have was Moe’s Express out of the men’s box and I hit it on the first try with a one in eight chance, I also got my first choice Jeremy 1st on a 1:3 and the showy fountain on a 1:5. Where the house won was the spy box, an event I didn’t really play to my donut detriment where my must haves were Crouching Panda Hidden Egg roll and Cafe Kafka. I had to empty the whole box to get them, but the consolation I guess is the three spy characters I got first earn money. So yes, as a premium player I will probably keep passing on paying full price now for a chance on a lower price later, you got my number EA. My current conundrum? Full price for teen Marge now or gamble that she’ll be back in a Valentine’s Day mystery box along with, I’m hoping, Itchy and Scratchy’s love interests. 175 donuts for Barney now or wait for mystery box? I share other people’s dissonance with having multiples of the same character wandering around and have since getting Rockstar Maggie but I’ve learned to live with it , especially since I love the animation on the Hyperstadium, I’m bad about using skins (had 27 in my Black Friday mystery box, largest by far and didn’t even bother) and would hate not having baby Maggie. So I guess having a duplicate is better than having yet another skin I probably will rarely use since the unemployment office changes them back. Sorry for the t l; dr post moderators, thanks as always for letting me ramble. No worries, from one rambler to another! I never got that the first few times it came around…and now I can’t get into the game at all. I’ll never experience this quandary but reading about it made me laugh. Hey everyone. Since last night when I try to open game first screen appears and it says synchronizing. Just before my username show up my game keeps saying “cannot connect to server”. I uninstalled and then installed again. Tried to open again and it opened. I saw my town and claimed some money from houses. After like 2 minutes sane thing happened. Now the game keeps saying “cannot connect server” afain. Anyone experiencing the same thing? Its been crappy like that all week for me. So annoying. Here’s my theory. This whole event, the new prize characters are the fictional ones from the stories being told. Since this was the story Lisa was telling, she narcissistically made the angel in her image. The creation starts with the traits she provided in the story, but once released into Springfield, the new character develops its own personality so it can look like her, but not necessarily act like her. What is the last item in the ticket pageant tab for this event? I got the required tickets, but never received the item.. it just went to the snowball tab? Should I contact ea that a part of the story didn’t initialize? You have a task to complete. This is covered in multiple threads. Scroll up on the list of tasks and you’ll see one not finished. Our friends here covered this a lot. Just so you know, your ads are constrictive to use. I have screenshots where an ad redirects the user and forcibly removes the ability to navigate back to your site or reject the ad. This will lower your traffic and decrease your revenue substantially if you do not remedy this issue to the user experience. As an example, it took ten minutes of navigating back to your home page and deactivating my data to keep the ad from redirecting me before I could post a comment. All the writers put time and effort into what they write, and my guess is it isn’t just for the money. They care, and they enjoy helping other players. Nevertheless, users won’t see what’s written if they’re unable to avoid these malicious ads. I started reading this back when it was tstotips. I commented on the first post, back when the max level was 40. This site has my loyalty. That being said, if I have to strategically deactivate my cellular data just to be able to access your content… the purpose is defeated. As they have stated before, they have no control over this. I like your rants and passion Patric! However this one might be a swing and a miss..I think everyone went a little too existential in this case. I stored that horrible nativity scene as soon. As I got it. You get a 1.5 bonus for the Nativity in your storage. If it has a bonus and you don’t like it hide it. Hi, sorry for being off topic… is there a post about the Springfield Heights building now contributes to more % XP? Thank you Addicts! They always have, but the boost was hidden and not shown in your % total. Now they are (and have been for some time) now reflected in the total. So just search for old articles. 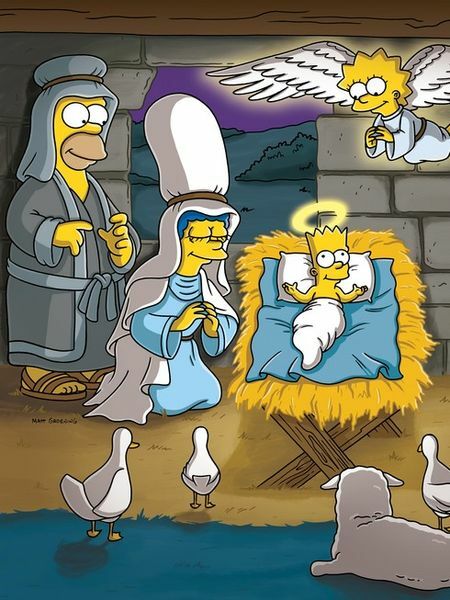 Uhh… it’s Lisa playing the role of Gabriel, just like Homer, Marge, and Bart all play the roles of Joseph, Mary, and Jesus, respectively. It’s a fantasy sequence, so I really don’t see any reason for anyone to get worked up over it. Personally, I’m just surprised that she’s a character, not a skin. But we have the same sort of thing with teenage Marge and Homer, so hey, whatever. Patric is funny, but I agree with you. The first one is Lisa playing the Angel Gabriel. The new one is an Angel that is not Gabriel but looks like Lisa. In most mythologies Angels were created before humans. Angels are separate entities. Humans, when dead, can (depending on your mythology) stay dead (ashes to ashes dust to dust), go to heaven, purgatory or go to hell or a version of either the underworld or eternal life. Holy humans may become a saint when dead but do not transform into an angel (except for in a few shows). Very… But, I got clobbered with this during Addicts Live. Love to read your story, ‘s i want more!!! Hilarious post, Patric! I agree with you. I really like Milhouse in that Pageant Stage task, that would’ve been such a fun holiday skin! Maybe the people at EA wanted to book it early for Christmas.